Did you know that you can enjoy apple picking right here in Toronto? Whether you’re looking to make apple pies for Thanksgiving, candy apples for Halloween or just to have fresh and healthy snacks on hand, there’s plenty of places across the GTA to pick your own apples. 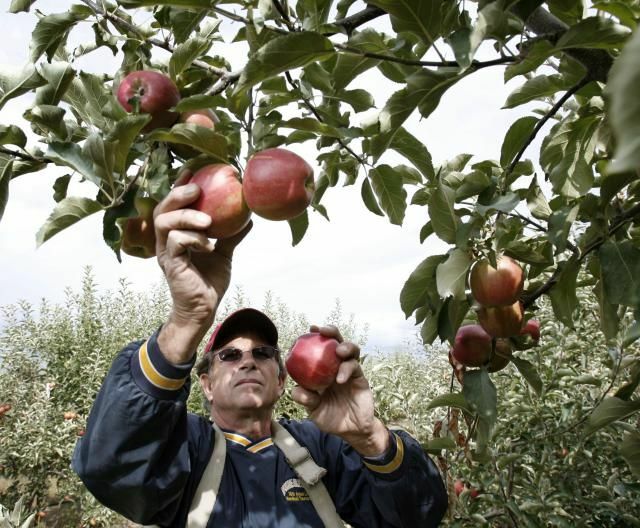 Here are some Apple picking tips, to help you get started! For more visit Foodland Ontario. Call first: Certain apple types may not be available due to demand and orchard hours can change without notice. What to bring: Some farms provide containers for carrying the fruit home, but it’s not a bad idea to bring them yourself. Comfortable shoes and clothes that you don’t mind getting dirty are a must, and keep the weather in mind: pack a sweater for cooler days, and bring sunscreen. Freezing apples: Coat 1 L (4 cups) of peeled, sliced apples with 1 ml (1/4 tsp) ascorbic acid powder and 25 ml (1/4 cup) cold water. Coat fruit on all sides, then toss with 25 ml (1/4 cup) granulated sugar. Pack, label and freeze for up to one year. Before using, frozen apple slices should be thawed for approximately one hour. Apple types: Some of the most popular types of apples are McIntosh, Honey Crisp, Red Delicious, Empire, Idared, Crispin (or Mutsu), Golden Delicious, Spartan, Cortland and Northern Spy. Northern Spy is the most common type of apple used in baking. Check with the orchards to see what varieties they have available.